For Memorial Day weekend, my World War II adventure Dark Full of Enemies is on Kindle Countdown at Amazon! Today through Monday the Kindle edition is only 99¢. 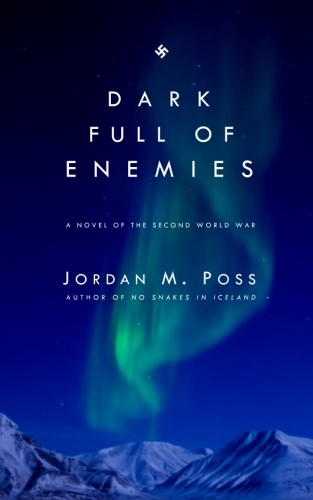 Dark Full of Enemies is the story of a team of Allied commandos sent into the Arctic night of Norway in December 1943. Tasked with destroying a Nazi-controlled hydroelectric dam, the team leader, Marine Captain Joe McKay, must confront the Germans, mysteriously uncooperative Resistance contacts, the darkness and unforgiving weather, and his own past as he struggles to complete his mission. 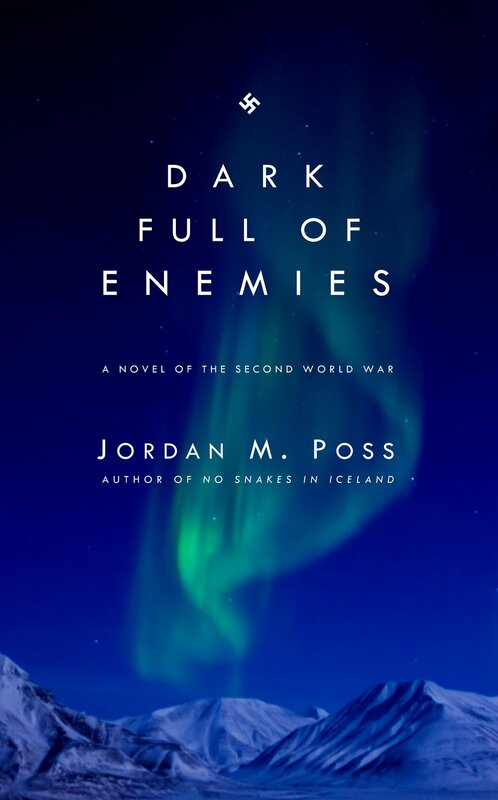 Readers have praised Dark Full of Enemies as "an awesome read," "a must read for any and all book lovers everywhere," and "an Alistair MacLean-style, World War 2 commando mission story" that "is simple to the point of poetry." Read more about the book, more reader praise, and find links to order at the novel's page here, or visit the Kindle edition directly here to order it while it's discounted. A few more reviews from readers have popped up in the last few months. 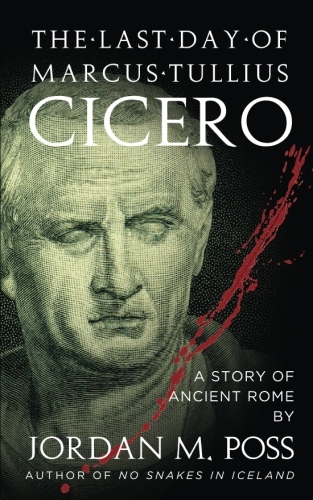 Jane, a retired librarian writing at Goodreads, writes that The Last Day of Marcus Tullius Cicero is a "deftly and smoothly written novella. . . . Highly recommended." Anthonia, reviewing Dark Full of Enemies at Goodreads, writes that she "enjoyed reading this fast paced book. Plus the characters were something else as well. The history is excellent along with the setting . . . A must read." Jim, reviewing the novel on Amazon, writes that he is "glad I wasn't on a mission such as this. They encountered trouble at every turn. A good model for an international team. Good read." Thanks to all! I appreciate such generous readers. If you haven't yet read one of my books and would like to, follow the buttons below to their Amazon pages, and please leave a review once you've read them! 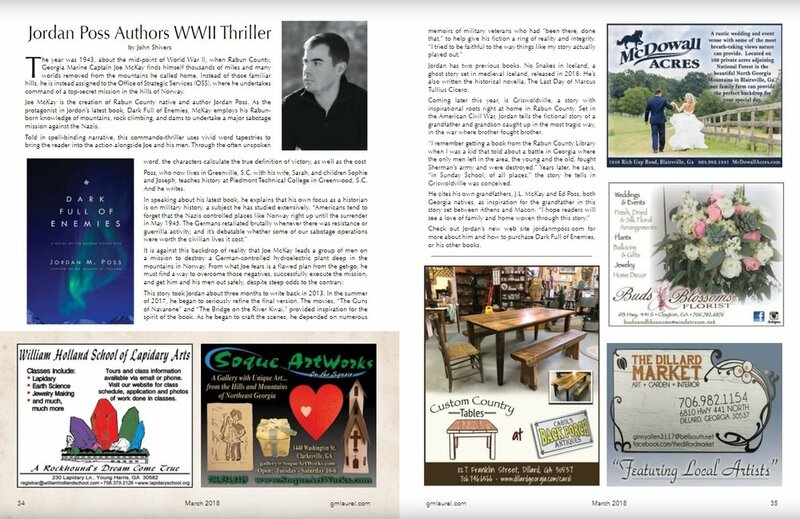 I'm grateful to Tracy, editor of the Georgia Mountain Laurel, a great little hometown magazine that I wrote a few pieces for about six years ago, and her writer John for profiling Dark Full of Enemies in the March 2018 issue. 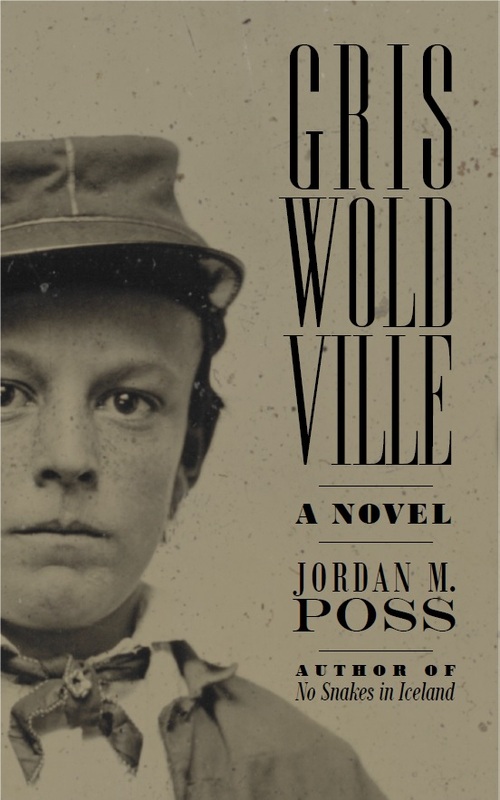 The article includes a brief summary and review of the book, a bit about myself, and a few details about my forthcoming Civil War novel Griswoldville. Check it out! Dark Full of Enemies has been out for a month now and the first reader reviews are coming in! An Alistair MacLean-style, World War 2 commando mission story. It follows McKay, a clandestine super Marine called on to form a team of expendables and blow up a Nazi dam in Norway. McKay is sleep-deprived, guilty, unsure of himself--yet focused and cold-blooded once the bullets start flying. When the novel revs up, it's simple to the point of poetry. Plans go awry; friendships are tested; trust is annihilated and restored; many things explode and get shot up in ways the reader will find satisfying. At its core, Dark Full of Enemies is the story of a man's search for meaning in the back alleys of a world at war. The action occurs in a place I had not heard of before and adds another dimension to the story. . . . The story helps make the characters come alive and the events move quickly. I would recommend this to those who like novels based on history but appreciate some action. In McKay, Poss writes a soldier in conflict with his senses of loyalty to country, duty to his mission, concern for his men, and dignity as an individual. The resolution to the conflict is satisfying, even if it has a whiff if blockbuster drama/thriller about it. Though Dark Full of Enemies is fiction, the war it takes place in was all too real. I would recommend this book to those interested in World War II and/or historical fiction. 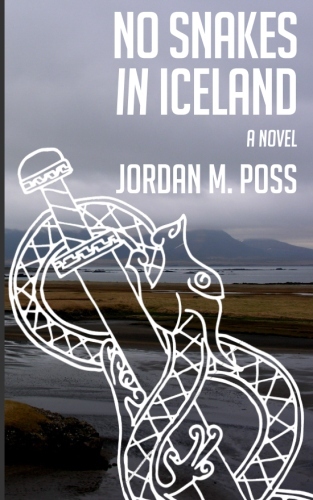 Personally, Poss' book has encouraged me to learn more about the Scandinavian campaigns. What an awesome read that has you from page one immersed into the story. He has the ability to make you part of the plot and to paint with words the environment you are in. The dark, the extreme cold, the danger surround you. I highly recommend Dark Full of Enemies!!! Once started, I couldn't put this book down. It takes the harsh realities and impact of war and pulls it glaringly into the light. . . . Doesn't matter if you are a history buff or just an adventure addict, this is the book for you. Check out the above reviews, and stay turned for more. If you've read Dark Full of Enemies, I'd love for you to share your opinion of the book on Amazon, Goodreads, or elsewhere. If you haven't, check it out and let us know what you think! A few paperback copies of Dark Full of Enemies have been sighted at Re/Max of Rabun in my hometown of Clayton, Georgia. They're available at the front desk for just $10, three dollars off the list price of $12.99. Stop by and pick one up while they're still available! If Clayton is too far a drive, you can always find it and my other books at Amazon. Enjoy! Blogger Jay Eldred, an old friend and fellow history teacher and Germanophile, has profiled Dark Full of Enemies for "Teaser Tuesday" at his blog Running in My Head. Check it out.